A cardmember since 1998, Harry uses his H-D™ Visa card to earn Harley Chrome® Cash to keep his bike “running sweet” for every Warriors’ Watch mission. Be sure to visit h-dvisa.com (http://www.h-dvisa.com/hd83962) and learn about all of the H-D™ Visa Card’s riding rewards. If your motorcycle didn’t come with saddlebags then they might be the first accessory you want to consider. You’ll need luggage space whether you do day trips or long road trips. Saddlebags provide a convenient place to pack tools, rain gear, toiletries, sweatshirt, jacket and a complete change of clothes. You may not be able to take ten different pairs of shoes or your hair dryer but at least you can bring along a comfortable pair of flip flops, sandals or sneakers on your next trip… if you have saddlebags. Saddlebags can be easily installed onto the rear of your motorbike. There are a number of detachable systems available or you can go with the traditional permanently mounted bags. There are soft bags and rigid bags. You can even go cowboy style with leather throw over saddlebags that straddle the passenger seat or fender. Before exploring the world of motorcycle saddlebags for Harley-Davidson® motorcycles it is important to decide what you want from your saddlebags. For example, Corbin Beetle Bags have a capacity of about 30 liters, which makes them perfect for some people but unnecessary for others. Size, capacity, durability and appearance are all considerations. These factors will determine which saddlebags are right for you. Which saddlebags appeal to your taste? There are many to choose from and only you can be the expert in what you like. Auburn Leather Legend bags are made from black American cowhide and have a very stylish appearance, so they are a great option for any rider who is concerned with how saddlebags will affect their motorbike aesthetically. They are available in throw over and bolt on and are a good size for most bikes. Another great looking bag is the Boss Bags, which come in either plain trimmings or black leather with heavy plastic. They are adorned with buckle straps making them attractive and easy to use. Viking Bags Desperado Saddlebags are some of the best saddlebags in terms of being hard. If your main concern is keeping your belongings protected and having bags that will keep their shape, these are the perfect choice. There are many shapes and sizes to choose from so you find the best fit for your bike. If quality and style is your priority, Patriot Hard bags are a great choice. They have a water tight gasket seal! They look great and are extremely practical. Your luggage will be dry, even if you get drenched in a downpour. You’ll be glad you have a dry change of clothes once you get to your destination. All of the products described above are the best quality hard bags for Harley-Davidson® motorcycles. 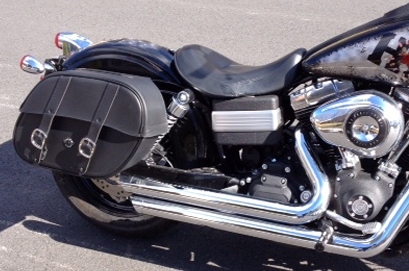 There are also soft saddlebags but we recommend hard bags for Harley®. Hard bags maintain their shape well and will offer the most protection for your luggage. There are many saddlebags to choose from and we wish you luck finding the best saddlebags for you! Both of these videos are on You Tube and I am just sharing them with you the Internet people. I’m not sure a person can just borrow someone elses video footage and I have to believe it belongs to a certain company. But I don’t know that any foul play is afoot either. While both videos are available we’ll enjoy the freedom to compare them. Try to get them both playing at the same time in squence. Full Throttle Weekend at Rommel Harley-Davidson in New Castle, Delaware on April 13th and 14th was big and exciting! For a dealership event it was pretty good. The simplicity of the event is what made it so good. Bring in three of the best custom motorcycle parts vendors, serve free hot dogs and hamburgers, and have two hot chicks walk around in short skirts with fish net stockings! Bam! Automatic zero to sixty motorcycle event… as long as you bring in spectacular weather too. And guess what?! Spectacular weather was served up as well as the hot off the grill burgers and dogs that the First State HOG volunteers were flip’n. The Drag Specialties, Precision Machine and Kuryakyn booths were cool. Rommel customers had the opportunity to see the latest and greatest chrome and powder coated accessories on the market. Drag Specialties and Precision Machine brought phenomenal custom motorcycles to display their hardware that were so impressive I almost didn’t notice those two young ladies in fish net stockings. The only thing that would have been cooler would be to have Roland Sands of Performance Machine fame on hand to sign my autograph book. Maybe next year.